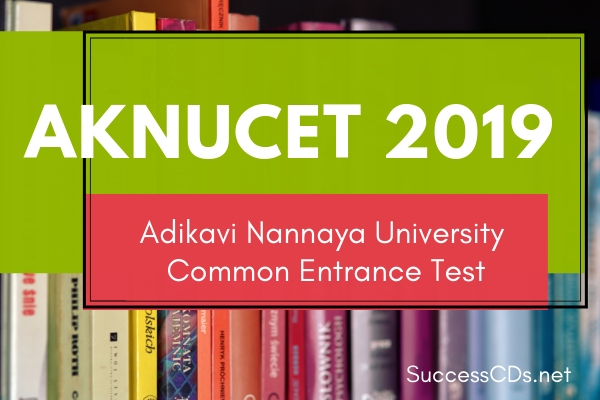 Adikavi Nannaya University has invites eligible candidates for admission through Adikavi Nannaya University Common Entrance Test (AKNUCET) 2019. AKNUCET 2019 is also known as NANNAYCET 2019 or NANNAYA CET 2019. Candidates qualified in advanced supplementary examinations of 2019 are also eligible. M.Sc. Physical Chemistry: B.Sc. /B.Sc. (Vocational) with Chemistry/Applied Chemistry and Mathematics & Physics as the other two subjects. M. P. Ed: B.P. Ed. Or B. P. E. equivalent to B. P. Ed. M.A. Telugu: B.A./B.Com./B.Sc./ with Telugu as a subject of study or B.A. (OL) or Bhasha Praveena with Part I Telugu of B.A. or B.Com. Or Bhasha Praveena with P.O.L. Candidates should be present in the exam hall, half-an hour before the commencement of the test. No candidate will be allowed to write the exam without hall-ticket. No candidate is permitted to leave the exam hall till the exam time is completed. NANNAYA CET-2019 will be conducted at the following Test Centres Srikakulam; Vizianagaram; Visakhapatnam; Amalapuram; Kakinada; Rajamahendravaram; Ramapachodavaram; Eluru; Bhimavaram; JangareddyGudem; Vijayawada. Hall tickets will be sent to the candidates, 5 days before the examination date; in case of non-receipt of hall ticket, candidates may contact at 0883-2566028 or send email to directoranur@gmail.com. Applications should be submitted through online only; for online submission, visit the websites www.aknudoa.in (or) www.nannayauniversity.info (or) www.aknu.edu.in.